The lesson to be recorded by the team. Ideally this is a contemporaneous process designed to capture current experiences and avoid retrospective bias. The data contained in the lesson to be validated and groomed by subject matter experts to ensure it is viable and accurate, to create useable information. The information then has to be codified against an understood taxonomy and stored in a retrieval system with appropriate cross referencing and indexing before it becomes usable knowledge. This process is time consuming and difficult, particularly given the lack of a defined taxonomy of project management terms. For example, terms such as PERT are used and misused in a variety of ways. Assuming all of the above is done well by an organisation, all it will have is a knowledge repository, a version of the ‘Corporate Knowledge Base’ described in the PMBOK® Guide at 2.1.4.2, that may be used. None of the knowledge has been transferred to a person who needs to know, and if that person does not know they need to know, they are unlikely to look or learn! Organisations that collect lessons learnt know that many lessons repeat from project to project. In the first instance there was new knowledge discovered (at least in the context of the organisation) but each subsequent rediscovery of the knowledge (ie, the same or similar errors were repeated on later projects) indicates a failure in knowledge transfer. Unfortunately unskilled human beings are very good at overestimating their knowledge! In modern times this is known as the Dunning–Kruger effect, a cognitive bias where unskilled individuals suffer from illusory superiority, mistakenly rating their ability much higher than is accurate. Conversely, experts tend to underplay their expertise. He that knows not, and knows not that he knows not is a fool. Shun him. He that knows not, and knows that he knows not is a pupil. Teach him. He that knows, and knows not that he knows is asleep. Wake him. He that knows, and knows that he knows is a teacher. Follow him. The learning journey needs to be understood and supported for an organisation to manage its knowledge and requires explicit understanding of both of yourself and the ‘world’ in which you operate. Personal bias and prejudice (we are all biased and have preferences). Errors in existing knowledge—what you know to be ‘correct’ is actually wrong. Taboos that forbid or prevent the seeking of specific new knowledge. Things you are not allowed to know. Many taboos are socially desirable and reflect ethical standards but others can be very limiting if the new knowledge contradicts current orthodoxy. Denial where seeking or accepting new knowledge is too painful to be contemplated; frequently aligned to deeply held beliefs. In addition, knowledge gained in a ‘different world’ can easily cause problems in changed circumstances, particularly if you are unaware of the differences between the ‘old world’ the knowledge was formulated in and the ‘new world’ you are about to apply it in; your skills and knowledge may not be as relevant as you think (but you don’t know this…). The availability of usable knowledge. Ways to trigger learning activity before problems occur. This may be as simple as a social media platform attached to the knowledge management system designed to enable conversation about the content and generate debate. ‘Real learning’ is a social process and needs coaching, advice and debate to reinforce the learning process. Ways to ensure tacit expertise is available to know what knowledge is applicable, and what knowledge needs to be adapted for use in the current situation, in the ‘new world’. Without the last two elements, organisations are left with burgeoning lessons learnt databases and hundreds of end-of-project reports but their people have no idea what to do differently to improve performance. The problem is the tacit knowledge needed to recognise the need and adapt the knowledge to the current ‘new world’ situation resides in peoples’ minds, is contextual, and as a consequence is difficult to transfer to another person by means of writing it down or simply verbalising it. Improving organisational performance needs personal interaction. 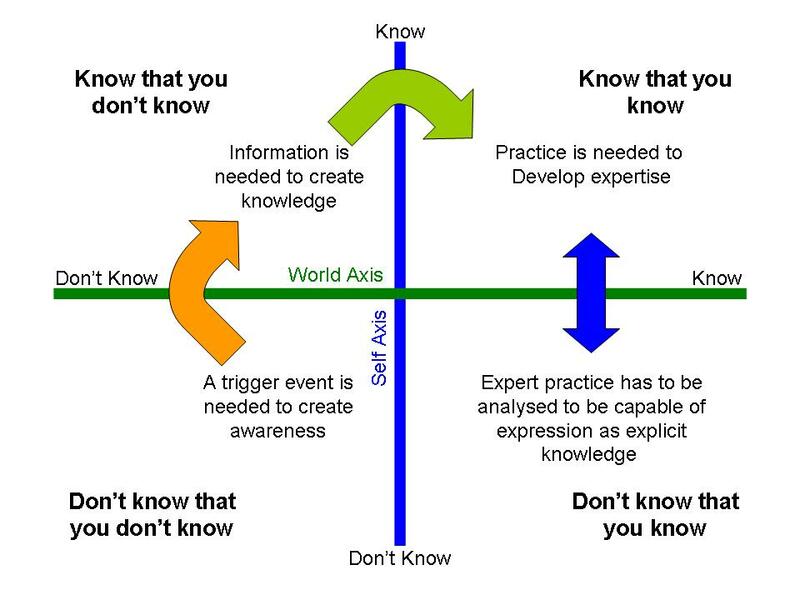 First, subject matter experts need help to translate their tacit ‘know how’ gathered over years into usable explicit knowledge; this is very often a difficult process as the experts literally don’t know all of the factors they use in formulating a course of action because much of their intuitive processing is subconscious. Then, less expert people need a friendly adviser overseeing their work to provide effective early warning of impending issues. Confucius is quoted as saying: “By three methods we may learn wisdom: First, by reflection, which is noblest; second, by imitation, which is easiest; and third by experience, which is the bitterest.” But imitation needs a helping hand… the less experienced need to be made aware of the fact that they need to learn something new. ‘Trigger events’ don’t have to be painful if the right advice is heeded at the right time. Lastly, learning is rarely accomplished simply by reading a ‘lesson learnt’. Access to effective coaching and mentoring is important to ensure the full richness of the lesson is passed on and the learning is adapted to the circumstances of the ‘new world’ in which it is to be applied. Every project is unique and consequently every ‘lesson learnt’ will need to be nuanced or adapted to work optimally in the new situation. In addition, some aspects of ‘knowing’ can only be learned by doing. This requires trust and encouraging people to relationships and networks so they will share knowledge and help each other learn. Far too many organisations believe knowledge management is an exercise in capturing and disseminating lessons learnt and therefore ignore personal know-how, experience and insights. As a result, they fail to develop the social framework needed to allow the full richness of knowledge to be available to their people. Lean teams, each focused on a single project actively works against social interaction and the sharing of corporate knowledge. 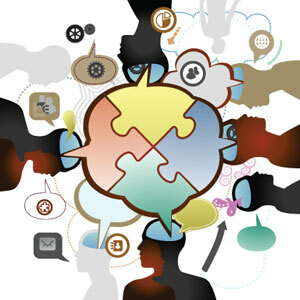 How effective is knowledge sharing in your organisation? Lynda, thanks for this article. Information management rather than remembering it is one of the biggest challenges for students nowadays. “Every ‘lesson learnt’ will need to be nuanced or adapted to work optimally in the new situation” – is the key point we all should remember.